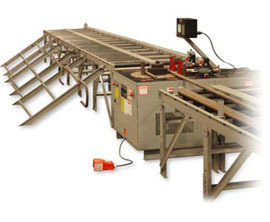 Along with our quality table benders, KRB offers a robust and flexible line of bender tables. Available in 3m sections and in two different styles, powered and economy, we can customize the right solution for you. Our power tables (pictured above) convey bar to your operator, saving operator fatigue and repetive motion injures. Our economy tables offer a solid, cost effective option.